More than half of Alzheimer’s caregivers are cutting back on everyday necessities in order to cover the cost of Alzheimer’s care, according to a recent survey by the ** Alzheimer’s Association**. 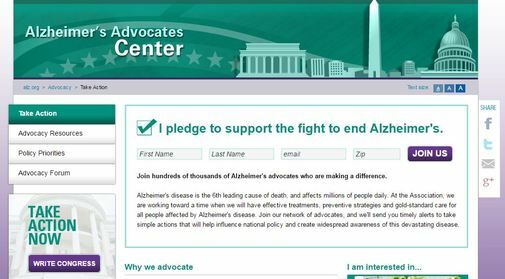 To dig a little deeper into the survey and its implications, I interviewed Beth Kallmyer, Vice President of Constituent Services for the Alzheimer’s Association, and Paul Hornback, who -- along with more than 1,100 other committed advocates -- attended the enormously successful Alzheimer's Association Advocacy Forum in Washington, D.C. in early April 2016. Paul’s personal interest in finding a cure stems from his diagnosis of Younger Onset Alzheimer’s Disease (YOAD) when he was 55. A cure could extend his normal life span, and help maintain his cognitive and physical health, for decades. Carol Bradley Bursack: Having been a dementia caregiver, I know firsthand the financial costs of dementia. Can you give us some ideas about how to help families with these financial challenges? Beth Kallmyer: The Alzheimer’s Association has known for a very long time that Alzheimer's is a costly disease. The survey helped us to understand how Alzheimer’s was affecting the everyday lives of people. ** We found that 50 percent of the families were cutting back on basic necessities -- things like food, transportation, medical care. This showed us that very few people were prepared for the cost of caring for somebody with Alzheimer’s. **** CBB:** Often, it is impossible to prepare for something like Alzheimer’s. Younger people who develop the disease and/or their caregivers may have to cut back on work or quit their jobs, which means that they not only lose current income, but they lose out on retirement benefits and lower their future Social Security payments. But how about immediate needs -- such as how to find and pay for respite care without going into debt? BK: One of the things that the Alzheimer’s Association recommends is that families educate themselves about the resources that are available, and make sure that they are accessing all that are available to them. Maybe there’s a veteran in the family and they can access those benefits. Or maybe there are retirement benefits. Even when these options aren’t available, we want families to understand what it’s going to mean to go on Medicaid, which is our country’s failsafe plan for paying for long-term care. Ultimately, what that’s going to mean is that people are going to have to spend down most of their resources in order to qualify. [But] being prepared means that people can make the most of the resources available and leverage the most options that they can. ** CBB:** Beth, I agree that education is necessary for people, especially education about Medicaid -- since many people do not understand how the program works. The Alzheimer's Association site provides an enormous amount of information. I continually send people to your site for education. Thank you. Carol Bradley Bursack: Paul, can you tell us why you're in Washington and what you hope your advocacy will achieve? Paul Hornback: As someone living with Younger Onset Alzheimer’s Disease, I’m here in Washington as a passionate warrior to end Alzheimer’s. I’m here to speak on behalf of the nearly 5 million Americans living with this condition, and to ask Congress to provide more funding so that we can live in a world without Alzheimer's Disease. I’m also here to let people know about the wealth of information available through the Alzheimer’s Association. After my diagnosis, I would have been lost without its help. Because of that information, I can live a life successfully with Alzheimer’s disease. CBB: It sounds as if you feel that your needs are being reasonably well addressed, but I would assume that you are going to press for more funding for care as well as research? PH: Well, yes. Alzheimer’s disease can devastate the best-laid financial plans. After my diagnosis, I had to retire early, which dramatically reduced my income. Because of that, my wife and I had to sell off most of our assets, sell off our homes and then dip into our savings just to make ends meet. So there’s a devastating cost that comes with this disease as well as the emotional turmoil. CBB: Most people would be understandably shocked, when they are young like you, to receive such a devastating diagnosis. What did you do? Where did you go? Who did you call? PH: The first thing I did was go online to the Alzheimer’s Association at alz.org. They have a wealth of information to get you on the right path. And through the Alzheimer’s Association, I took all kinds of educational classes about how to live with the disease, how to follow the best practices, and then how to get your financial house in order so you can live better financially with the disease. CBB: Your information underscores why I send so many people to Alz.org, and you, Paul, know the advantages probably better than anyone. Beth, could you expand a little on what else can be done to help people manage this burden, as well as anything that we haven’t covered that you’d like to mention? BK: Sure. The Alzheimer’s Association recommends that if your family is impacted by this disease,** the most important thing that you do, as Paul did, is reach out and get some help**. This disease goes on for a long period of time and families need to have that support in place for them -- [not only] the emotional support, but also how to get the financial plans in place so you can know what to expect. If people need additional support they can go to our website or call our 800 number where they can talk to somebody 24/7. That number is 1-800- 272-3900. ** CBB:** Thank you Beth and Paul. Our time is running short so I’ll let both of continue on in your quest to help others. BK and PH: Thank you, Carol. Carol Bradley Bursack is a veteran family caregiver having spent over two decades caring for a total of seven elders. She is a longtime newspaper columnist and the author of “Minding Our Elders: Caregivers Share Their Personal Stories,” as well as a contributor to several additional books on caregiving and dementia. Her websites can be accessed at www.mindingourelders.com. Follow Carol on Twitter @mindingourelder and on FacebookMinding Our Elders.